There are more than 7,000 single-gene diseases. Individually, each of these may be rare; however, when considered together, they are the cause of a significant number of childhood deaths, illnesses, and healthcare costs. 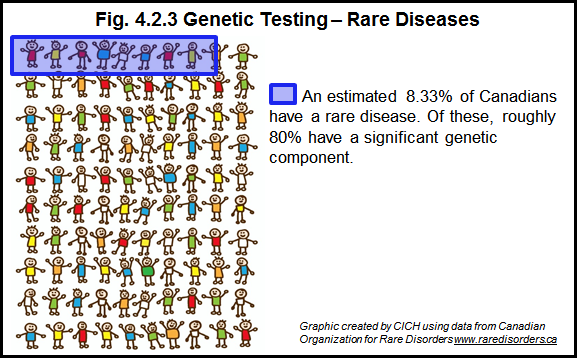 Very often, rare disorders remain undiagnosed and have few therapies. There are substantial costs to the healthcare system when caring for children with rare diseases. For example, approximately a third of childhood hospitalizations involve children with rare diseases.4 These children also have a disproportionate number of hospital admissions and they tend to stay longer in hospital and incur larger hospital bills. The relatively small number of children with rare diseases in Canada, as well as in the world, presents challenges for rare-disease research. Recent governmental initiatives have been launched in an effort to support the application and integration of rare disease research. Orphanet Canada and the International Rare Disease Research Consortium work to rapidly spread research findings regarding rare diseases around the world and to facilitate action based on the findings.